In the face of a highly competitive academic environment, it is easy for children and parents alike to feel the pressure of performance cloud what could otherwise be a pleasurable learning experience. 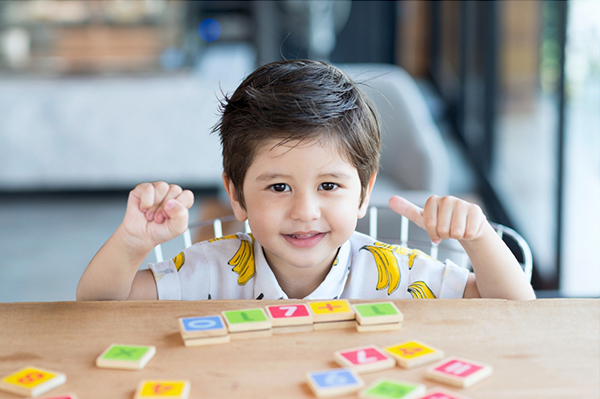 When a child sits down with a subject, their focus from the word ‘go’ is to excel at it, but the method needed forgetting there often includes faulty practices such as rote-memorisation. Without developing a positive attitude before approaching it, even the brightest of children tend to develop a fear of the subject. This fear is one of the biggest impediments to any child reaching their fullest potential. A child’s schooling days are the most important in their life, and it is important for them to learn earlier in life that learning is an enjoyable and fruitful lifelong journey. So then, how exactly does a so-called ’positive mindset’ really improve a child performance, and how can a parent help them achieve it? Let us take one of the most commonly feared subjects - Math. We often see students who admit to being afraid of numbers, without even realising that all it really takes to excel at the subject is conceptual clarity and frequent practice. While different students will undoubtedly learn at different paces, a student learning at a slightly slower pace need not fear the subject or believe they cannot excel at it the way their peers can. In order to avoid this, it is important for parents and teachers to remind the child that they need not compete with other students during the learning process itself. For students showing a lack of interest and attention while learning, it is important to incorporate innovative and light-hearted teaching methodologies that can keep them engaged in the subject. When a student begins to look forward to going for a class, their enthusiasm will automatically translate to an increased interest and better quality performance in the subject. It is a common misnomer that only quantifiable measures of intelligence (i.e., IQ) can indicate how well a child is able to perform at a subject. But IQ is not the only factor that influences a child's performance. A scientific study conducted at the Stanford University School of Medicine has recently found an actual brain pathway that links a positive attitude toward Math to higher achievement in the subject. It was found to be connected to the better functioning of the hippocampus, which is an important memory centre in the brain, especially as a child solves arithmetic problems in Math. The research administered standard questionnaires to 240 children aged 7 to 10, and found that even with factors such as IQ accounted for, students with a positive attitude toward math were linked to better performance in the subject. It suggested that those students who develop a strong interest and self-belief in their potential in the subject perform certifiably better at it. The study, published on 24 January 2018in Psychological Science, also gives an explanation as to why a passionate and inspiring teacher can influence the attitude of a child towards a subject, and subsequently enhance their performance in it. It’s time to look beyond conventional methods of education and inculcate a passion for learning in your child. In subjects like Math, it is important to ensure that the student enjoys learning concepts, and willingly partakes of practice sessions outside of their schooling hours. One of the ways is to ensure that your child is getting ample play time and is engaged in extracurricular activities that he/she enjoys. This prevents them from getting bored of learning. If it is enrichment you are looking for, centres such as S.A.M (Seriously Addictive Mathematics) help inculcate a positive spirit in the classroom. With innovative teaching methodologies and hands-on activities, they can help your child enjoy learning rather than resent it. When your child volunteers to go for a lesson in Math, you made the right choice.